It is snowing like crazy here, thank goodness. Here's the real snow report: we lost about 18 inches of the 30 inches of snow we had on the ground in yesterday's warm and rainy windstorm. Winds topped 70 mph here; there are many trees down and limbs across wires, etc. Mount Van Hoevenberg is closed in order to clean the trails of debris and will re-open tomorrow. Whiteface is open with the lower mountain, Little Whiteface, ready to go. The cold front came through about 9:00 last night and the rain changed to snow, so we have about two inches of fresh snow on 12 inches of very hard pack. I imagine the back country has breakable crust and will need a few more inches of fresh snow to be back up to snuff. It is really fun to visit the Olympic Speed Skating Oval in the Village of Lake Placid this time of year. You can skate on the oval where Eric Heiden won his five gold medals in the 1980 Olympic Winter Games. The birds have discovered the smörgåsbord of feeders here at the homestead. 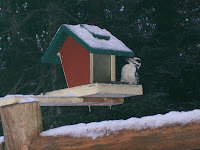 Today's star is Mr. Hairy Woodpecker.